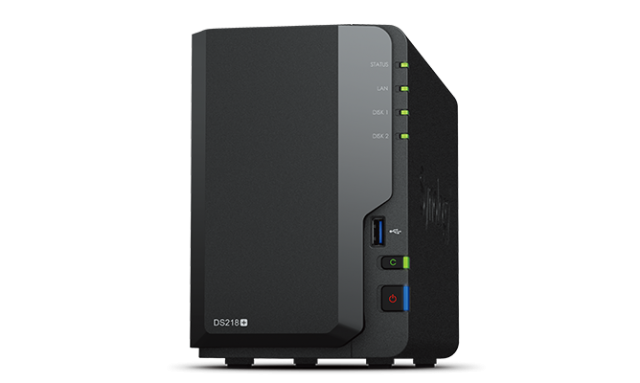 The new DS218+ is the most impressive NAS in Synology's two-bay range for home users. It's got powerful hardware and lots of features that you expect in the high-end segment, like a versatile operating system, a solid selection of ports, and support for 4K video streaming. Those specs make it a very attractive option for power users and consumers who want a future-proofed NAS. Question is, does it have what it takes to also impress in real-life? I've tested the DS218+ to find out. The DS218+ features a 64-bit dual-core Intel Celeron J3355 processor coupled with 2GB of RAM. It comes with two slots for the memory, with the second allowing you to add 4GB more for a total of 6GB. Encrypted transfer speeds are quoted at 113MB/s for reads and 112MB/s for writes. The NAS supports 4K video transcoding at a maximum frame-rate of 30FPS, DLNA, up to 24TB of storage, SATA HDDs and SSDs, Btrfs and EXT4 file systems for the drives, RAID 0 and 1, Synology's Hybrid RAID, up to 2048 local user accounts, 256 shared folders, 80 download tasks using the Download Station app and 50 email clients, and up to 20 VPN connections. For multimedia consumption, the DS218+ is an excellent choice thanks to its solid video transcoding capabilities. It's part of 4K Group 1, the top classification for Synology devices, which includes only NAS units with the "plus" designation in the name, the DS418play and DS416play. The DS218+ has a small footprint, mainly due to the way the two bays are positioned inside. These are installed vertically, behind a front panel that's very easy to remove, allowing the NAS to be quite narrow. This is good news if you do not have a lot of space available. In my case, I installed the DS218+ next to my router, using a wired connection. The NAS has a Gigabit LAN port, which enables theoretical transfer speeds of up to 1000Mbps (or 125MB/s), which my router can match. It also has three USB 3.0 ports and an eSATA port to connect additional drives. On the front, you will find status LEDs for the NAS, LAN connection and the two drives (if you only have one installed, the other LED light will stay off), a USB port, a USB copy button (which lets you trigger direct copying of files when you have an external drive connected) and, last but not least, the power button. On both sides of the DS218+ you will find a Synology logo that is drilled, to help the airflow. There are also holes on the bottom of the NAS. Hot air is extracted using the 92mm fan on the back. The drives and all the sensitive components are well ventilated. Synology offers three operating modes for the fan, with quiet being the default one. Switching to cool or full-speed increases the fan's rotation to bring the temperature down, but this comes at the cost of increased noise. The default mode does a great job in my case, with the thermal status being reported as normal by the DS218+. On the back of the device you will also find the other two USB 3.0 ports, the Gigabit LAN port, the power port, the eSATA port, the reset button and the Kensington Security Slot. Adding and removing drives is made really simple by the fact that the DS218+ has tool-less bays and front cover. You need little effort to pop the cover (as it's held in place by four rubber pins) and the bays can be ejected by pressing the button at the top of each one. Once you place the drives inside, you only have to pop the trays back in and attach the cover to be ready to go. With the drives inside, after you power the DS218+ on you will be taken through the setup. At this stage, you will configure things like the username, password and format the drives, and also install the latest firmware. It's all pretty straightforward. Because Synology installs the firmware and stores your information on the drives, if you move the drives from another DiskStation device you will be able to pick up from the state you left off. As a benefit, for instance, all your download tasks will be preserved. Also, based on what I have read, this means you will basically leave no personal traces on the DS218+ when you pull the drives out. DiskStation Manager (or DSM) is Synology's NAS operating system. It's what makes the company's devices so versatile and attractive. It has tons of useful features included out of the box, and, if you want to add more, it also gives you the option to download apps from the Package Center. For instance, if you need a download manager you can get Download Station. For playing video, there's Video Station, which works in the browser (like Netflix, though content is pulled from the drives). There are also apps for photos, music, security, syncing files in the cloud, mail, web servers, software version control (like Git), Docker, DNS, chat, CMS (WordPress, for instance), databases (Maria DB), software development (Java, Mono, PHP and Node.js, among others), and more. The benefit that these apps, or add-ons, offer is that you can use the NAS a server for version control (using GitServer) when you develop software, to host your website (using the WordPress app, for instance), music streaming, or as a mail server, among other things. And, because you can make the resources available to the network and across the Internet, you can share these with others. It's a well-rounded ecosystem that has something to offer for everyone. 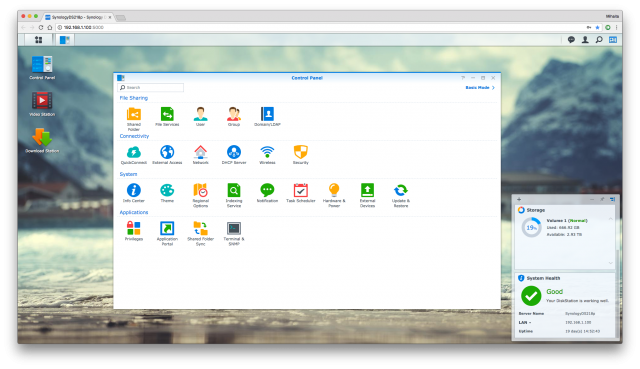 The apps do not come only from Synology, as other companies also offer clients through Package Center. Synology lists all the available add-ons on its site. The DS218+, being a range-topper, is able to handle most (if not all) with ease. The add-ons that I have used the most are Video Station and Download Manager. 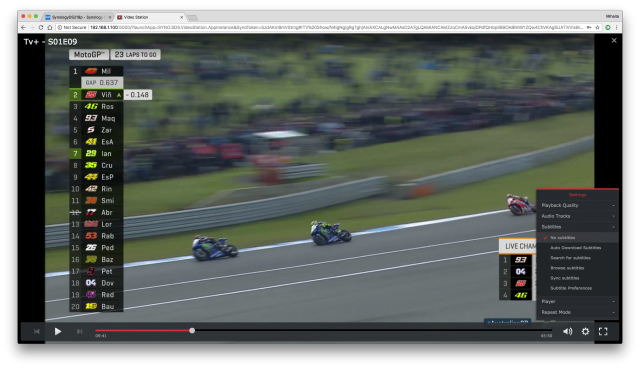 The former is great for watching videos; just like Netflix, it autoplays the next video in the TV series. Download Manager is similar to BitTorrent clients, though it also supports downloads from other places (like FTP servers). The benefit is that I can have content downloading straight on the NAS, without having to keep my laptop open. Synology frequently updates DSM, so you will get lots of updates (which can install automatically) that improve security and add more functionality. At the time of writing this article, the DS218+ runs DSM 6.1.4-15217 Update 2, which was released on November 22. When app updates are available those will also be installed automatically. I have used the DS218+ with a Wi-Fi 802.11ac router hooked up to a 300Mbps Internet connection. Being designed with power users in mind, performance did not disappoint. The DS218+ handled high-resolution video with ease, quickly downloaded files from the Internet and worked smoothly when DSM was open in the browser. There was a noticeable improvement in responsiveness over the DS418j in that last case, no doubt because it has a more powerful processor and more RAM. Download speeds over the Internet were the highest that I have seen at over 30MB/s. The processor is not overworked by such tasks, with the NAS staying responsive during large downloads. The same goes for watching videos in Video Station (Synology's video player, which runs in the browser). The fact that it handles 4K and supports RAM expansion indicates that it is a good option for long-term use. As more and more 4K content becomes available, it is nice to know that the DS218+ will be able to handle it with ease. At this stage, I have not ever felt that the amount of RAM it comes with is insufficient, but, again, it's nice that you can add more. The DS218+ is designed for consumers who want more from their NAS and, as such, its level of performance is unmatched in Synology's two-bay range for home users. It supports 4K video transcoding, which makes it future-proof in the multimedia department as well. What's more, unlike many NAS devices on the market, it also lets you expand the RAM later down the road. How much? It's available for $299.99 on Amazon.